It has been about 3 weeks since we returned from our South American sabbatical. This has given us time to reflect on some of the things that we may not have captured in our daily observations. So here are some of the subtle delights, “oh I didn’t realize” moments and a few things that just popped into our heads. First, we were genuinely surprised that anyone would follow our blog and that it would be of interest. Thank those of you who kept up with us and commented – it was fun and rewarding for us to know that you were experiencing along with us. 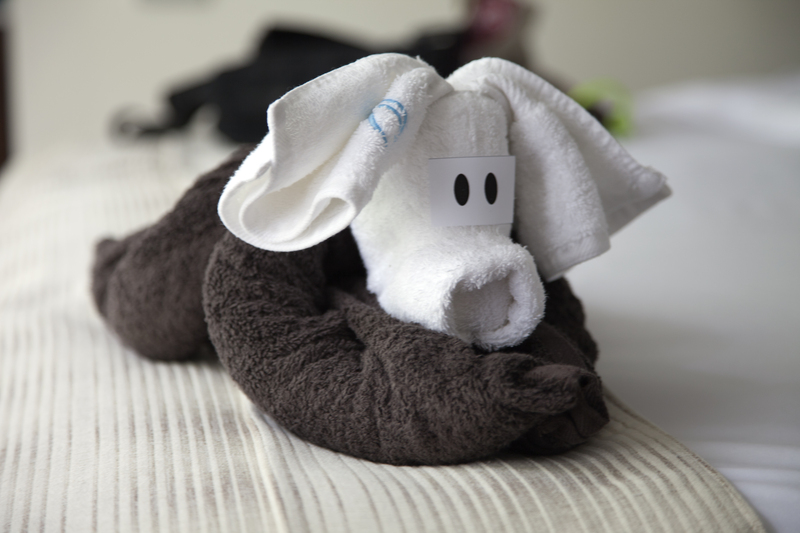 We failed to mention the towel art encountered in many of our rooms during our trip. Our first introduction was at the Salcantay Lodge the beginning of our hike to Machu Picchu. During our hike each lodge presented us with a different creature every evening. On the Amazon River, the Aria crew not only dressed our cabin with a new face each day but held a class on how to make the animals ourselves. We were given a couple of “eye” stickers to get us started on our own creatures. Fortunately for us and our blog readers, we had wi-fi in almost every corner of our travels. With the exception of both boats (the Eclipse in the Galapagos and the Aria on the Amazon River), we were connected. It wasn’t always swift or stable but with enough patience we could pull down periodicals, access Kindle purchases, buy Ipad and Iphone apps, and post content. It was impossible to count the number of people who were on their cell phones or other devices at Machu Picchu or Iguassu Falls yelling “You won’t believe where I’m at this moment”. We experienced long days and short nights as we moved south. Initially, it was rather odd planning a hike at 6 pm and showing up for dinner after 9 pm but that was the nature of the southern hemisphere. Although it was summer, many of the days reminded us of winter in the bay area of California with temperatures in the 50-60 F and rain. This was particularly true in the mountains of Peru and later in Patagonia. Although in Patagonia, we added another weather dimension – nonstop wind. People warned us that we would have wind but it is hard to imagine until we experienced the howling 24-7. It was interesting to observe to the adoption of eucalyptus trees, especially in Peru. While the San Francisco area has battled the removal of these non-indigenous trees, the Peruvian government has subsidized cultivation for timber and reduction of soil erosion. On the other hand, we saw many familiar plants and flowers grown natively there as well as in our geographical local. It is amazing how many orchids are grown in the forests of Peru and how dainty they grow which makes them hard to spot without their brilliant colors. As we moved from north to south, we noted the number of people of European descent in Chile, Argentina and Brazil. Many of the original ranchers, sheep herders and farmers came from Scotland and northern Europe. And of course, the Spanish influence is pervasive with the exception of Brazil where many Portuguese settled. With regard to fellow travelers, we observed that the East Coast and the West Coast supplied the greatest number of US travelers to our same destinations. There was very little representation from the American heartland. Florida, due to its close proximity, was particularly well represented by those having made multiple trips to South America. Far south at Estancia Christina, we met English, Scottish, Italians, and Germans. Ponta Dos Ganchos, the resort along the Brazilian coast, drew from Eastern Europe and Russia. One of our moments of pure enjoyment was late one evening in the Lima airport lounge, waiting for our overnight connection, where a large juicer was set up for squeezing fresh orange juice. After throwing in our own fruit, we pushed the button and had one of the best glasses of fresh juice imaginable. For some reason, our packing for our return trip seemed to require more luggage although we made minimal purchases along the way. But we did end up requiring an additional duffel. 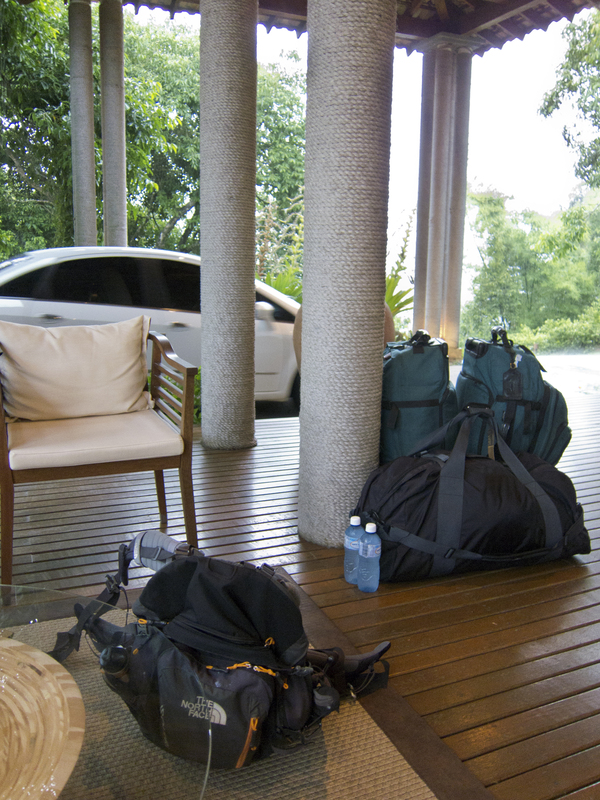 Below is the ‘after’ picture of our bags waiting for our ride to the airport for our flight back to the US. And so, another sabbatical is complete. Time to share our pictures on our website: http://www.rizbee.com. This entry was posted in Sabbatical 2011-2012, Travel. Bookmark the permalink.